Zambia coach Herve Renard dedicated his side's Africa Cup of Nations win to the victims of the plane crash that killed 18 members of the team in 1993. 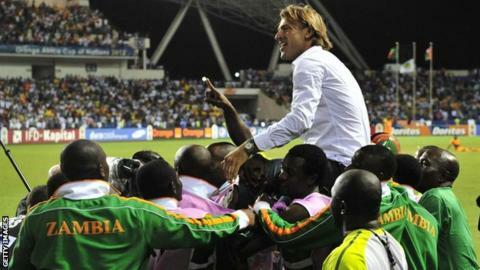 The Chipolopolo beat Ivory Coast 8-7 on penalties in Libreville, Gabon, to secure the trophy for the first time. "I told them if we got to the final we would play in Gabon where the plane crashed. There was a special significance in that," Renard said. "They found the strength. I don't know where," he added, fighting tears. Renard also praised the courage of Kalusha Bwalya, an iconic figure in Zambian football who would have been on the 1993 flight - which was taking the Zambia squad to a World Cup qualifier in Senegal when it crashed shortly after take-off from Libreville airport, killing all 30 people on board - but had made his own way there. "Kalusha was one of the best Zambian players of the last century," Renard said. "Then he was coach of the national team, now our [Football Association] president. "He knows how terrible this crash was for the nation. "I want to dedicate this title to him, he gave me my chance when nobody knew me." Football Association of Zambia (FAZ) president Bwalya, in turn, praised the French coach, and immediately looking ahead to the upcoming Nations Cup 2013 and World Cup 2014 qualifiers, said Renard "can stay as long as he wants". "I think that if he brings that discipline, that ambition that he has, as a coach, I think that he has made a statement for himself," Bwalya told BBC Sport. Stoppila Sunzu converted the winning spot-kick in the final for the jubilant Zambians, after Arsenal striker Gervinho missed for the Elephants following a goalless 120 minutes. The defeat saw Ivory Coast miss out on their second title, despite not conceding a goal from open play in the entire competition. Renard also described his side's unlikely triumph as an "enormous" achievement. "My players were magnificent," he said. "I know we're not the best but we have a strength and force that animated our team and made us African champions. They might make some tactical mistakes here and there but you can see the talent. "This is something enormous - something that appeared unrealisable before the competition began," added Renard, who managed Cambridge United briefly in 2004, before spending two years in charge of French side AS Cherbourg.